Empathy is one of the 5 elements of emotional intelligence and, in my experience, the one we most struggle to understand and express at work. Empathy is when we understand the emotions and actions of others. But so often we just cannot understand the rationale and behaviors of others. We strongly disagree with their position or decision. And so we feel we cannot empathize with them. And now we are stuck feeling we can neither agree with nor understand their position. How do we manage this situation? I was at a course last month, as part of my ongoing coaching education, in which this point was made: Empathy is not agreeing. It is not even about understanding the rationale or position of another person. Instead, empathy is feeling what the other person is feeling. Empathy is noticing the other person’s emotional state and then feeling that emotion ourselves. In empathy, we can imagine how the other person might be feeling. How many times have you felt frustrated that your ideas weren’t accepted? How many times have you felt frustrated that your ideas and thoughts weren’t heard? In the end, which do you care more about? For most of us, the answer is the latter – – we want to feel that our ideas and thoughts are at least heard. So we know that empathy will help our team feel heard and valued, and thus confident and capable. And we know that empathy, as an element of emotional intelligence is what separates the great leaders from the good leaders. But how do we show empathy? 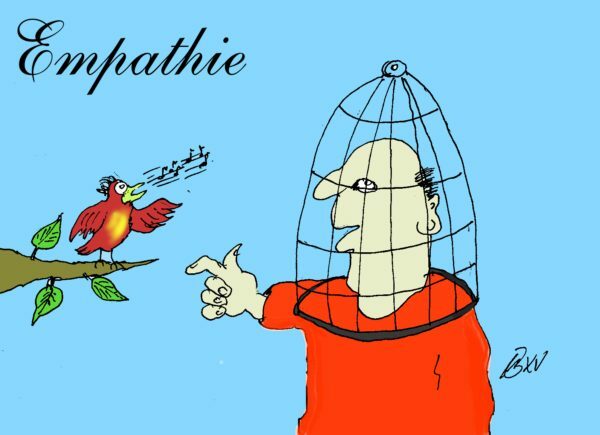 By definition empathy is an invisible skill – – just a feeling. Ask open-ended questions. Questions that start with “What” or “How” are a good rule-of-thumb to ensure your question is open-ended. These questions show your colleague that you want to understand their position more thoroughly, which aids in empathy. Ask questions without judgment. Remember, you’re not trying to assess the value of the idea. You’re trying to show you’re listening openly, another expression of empathy. Ask questions such as, “I can imagine what you’re feeling is…” This is the verbalization of empathy. You are attempting to put words to their feelings. Fully listen without thinking about your response or rebuttal. Again, you’re not trying to change minds in this conversation, so there’s no need to be thinking about your reply. Just listen for the feeling. Fun side fact: Mindful listening, in which we fully engage and are exclusively listening, not analyzing, provides as much restorative benefit as the same number of minutes spent in meditation. You can be exercising good mental health, while sharpening your empathy skills, while helping a colleague feel heard – – a 3-for-1 value! So go ahead and agree to disagree. Have different viewpoints on what is the best course of action. In the end, exhibiting empathy is what matters. What your colleagues will value more from you is that you took the time to understand how they are feeling. In this way, you will become a leader who exhibits the emotional intelligence needed to support and motivate your team to have the confidence to achieve your next collective goal. And the empathy to understand each other along the way.